Background: The use of effective contraceptive methods must be encouraged among adolescents, not only to prevent unintended pregnancies but also to promote the sexual health and well-being of these young people. 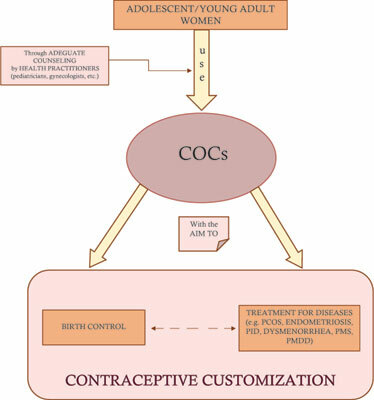 In effect, hormonal contraceptives offer several benefits beyond prevention of pregnancy to every woman, in particular to adolescents (e.g., dysmenorrhea, irregular bleeding, hirsutism, acne); moreover, they can be a targeted therapy for some gynecological diseases (e.g., endometriosis, polycystic ovary syndrome), to ensure a better quality of life. Objective: The purpose of this article is to review the different formulations of COCs for adolescent and young adult women, and analyze their efficacy, safety, and benefits of specific pathological conditions. Methods: We screened published literature on PubMed/MEDLINE and Scopus, using as keywords “oral contraceptive” in adolescent and young adult women. We included only articles in English about the COCs, different regimens and formulations. Results: Our literature analysis allows us to underline the important role of COC not only as birth control method, but also as valid treatments for gynecological disorders related to hormonal fluctuations (e.g., dysmenorrhea, irregular bleeding, hirsutism, acne) and pathological diseases, such as polycystic ovarian syndrome (PCOS), endometriosis, with a preventive role for fertility preservation and pelvic inflammatory disease. Conclusion: Adequate, care and competent counseling is the key to achieve good compliance of young women with contraception. Through the “GATHER” method suggested by WHO, health care providers should first evaluate the balance between benefits and risks of hormonal treatment, create an appropriate safety profile and then recommend COC prescription in adolescent and young women. Adolescence, contraception, pregnancy, complications, counseling, sexual health.